IBASSIN: Ontario MNRF Spot Check Station a Welcome Sight! Ministry of Natural Resources and Forestry held a fish and wildlife check station which yielded nearly a freezer full of seized fish on Saturday. From approximately 2 p.m. to 10 p.m. MNR Conservation Officers set-up just north of the intersection of Telephone Road and County Road 28 just north of Highway 401. Conservation Officers directed people with boats along with periodic checks of vehicles to enter into a works yard just west of the intersection. Numerous Conservation Officers then checked licenses along with vehicles and boats to see if everything was in order. Conservation Officer Mike Duncan with the opening of bass season in most fishery zones the officers were checking for bass, walleye, panfish, perch, crappy and other types of fish. The main reason the fish were seized is the fish were transported in a live well. Duncan said a few of the reasons are protecting the transfer of fish from lake to lake thereby preventing disease, commercialization of fish. People who sell or trade them. With County Road 28 being a gateway to Rice Lake and the Kawarthas from Highway 401 it was very visible to anglers that the Ministry of Natural Resources and Forestry are proactive in their efforts. Along with the fish, a live painted turtle was also seized and the person was charged. Alexander Mazzuca was on his way home to Vaughan after a bass tournament at Rice Lake when he was stopped and checked. The same sentiment was also shared by Bob Langlois who was on Weller’s Bay and Rice Lake for a day of fishing with friends. Langlois said the fishing was great on both bodies of water as they caught a number of bass and walleye. Port Hope Police officers also were on site at the inspection. One person was cautioned regarding a minor CDSA infraction. The person’s pickup truck was towed from the area because it was deemed unsafe with no tread in the tires. For a first time offence of having fish in a live well is $240. 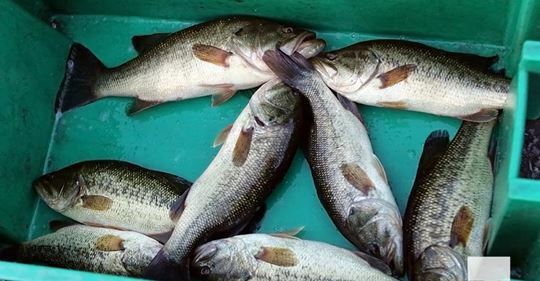 MNR officials advised Today’s Northumberland that all the fish were delivered the same night to the Brock Mission in Peterborough which has a kitchen.